We investigate materials for solar energy conversion such as solar cells and solar fuels! The Solar Energy Materials Laboratory (SEML) is one of few laboratories in SNU that focuses mostly on the solar energy utilization including photovoltaics and solar fuels. We are particularly interested in new materials and new device geometry of the next generation solar cells beyond Si photovoltaics. Our major research fields include, (1) halide perovskite solar cells, (2) chalcogenide thin film solar cells, (3) tandem solar cells for exceeding theoretical efficiency limit, and (4) solar fuel generation systems (e.g. PV-integrated hydrogen evolution or CO2 reduction systems and electrocatalysts). 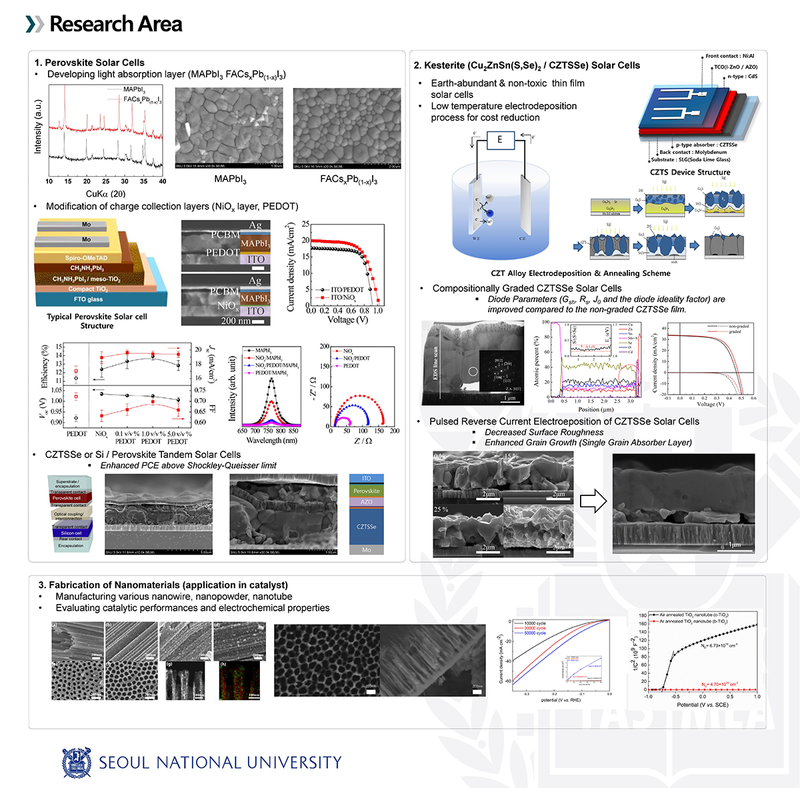 As a result of the recent research efforts, we currently have developed the world-leading sciences and technologies on the perovskite solar cells, electrodeposited CZTSSe solar cells, and the perovskite-based tandem solar cells. Multiple positions are available for graduate students and postdocs interested in Materials for Photovoltaics!